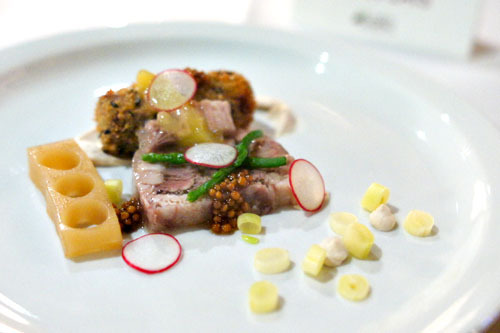 Regular readers may recall Ryan Carson's 16-course degustation at AnQi earlier this year. It was, without a doubt, one of the best meals that I've had in Orange County, and as such, I wasn't terribly surprised to find out that the Chef recently left the restaurant to pursue his own venture. 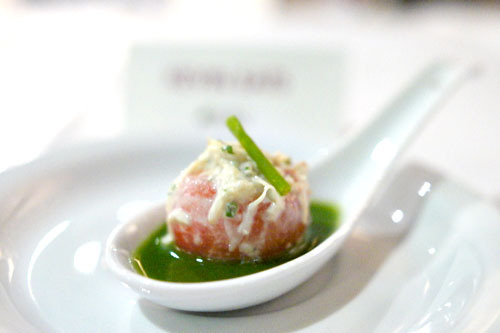 Carson is in the midst of planning a boutique eatery, to be opened somewhere in Los Angeles in the middle of 2012. However, he'll be popping up here and there in the meantime (initially at both AnQi and Tiato--he's still very friendly with the An family), and I was very curious to see what the Chef had been up to. About the Chef: A California native, Carson began his culinary career at the age of 15, working as a dishwasher at PCH Grill in Disney's Paradise Pier Hotel. He excelled under the tutelage of Executive Chef Bill Orton, and eventually became a Sous at the resort. Following, Carson was recruited by Andrew Sutton (from Napa's Auberge Du Soleil) to open Napa Rose, and after two years there, went to work under Adam Baird at Robert Mondavi's Golden Vine Winery. At this point, Carson decided to pursue formal training, and thus enrolled at the California Culinary Academy in San Francisco. During his tenure there, he worked stages at a number of notable eateries, including Gary Danko, Aqua, Farallon, and Jardiniere. 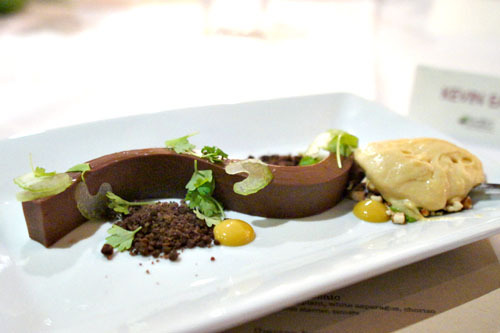 After graduation, Carson went back to Napa Rose, where he would meet Sous Chef Michael Rossi. The two eventually became inseparable, and when Rossi left to become Exec Chef at Ambrosia in Santa Ana, Carson followed suit. Their relationship there lasted three years, but Rossi eventually left the restaurant, leaving the 27-year-old Carson as Ambrosia's new Executive Chef. 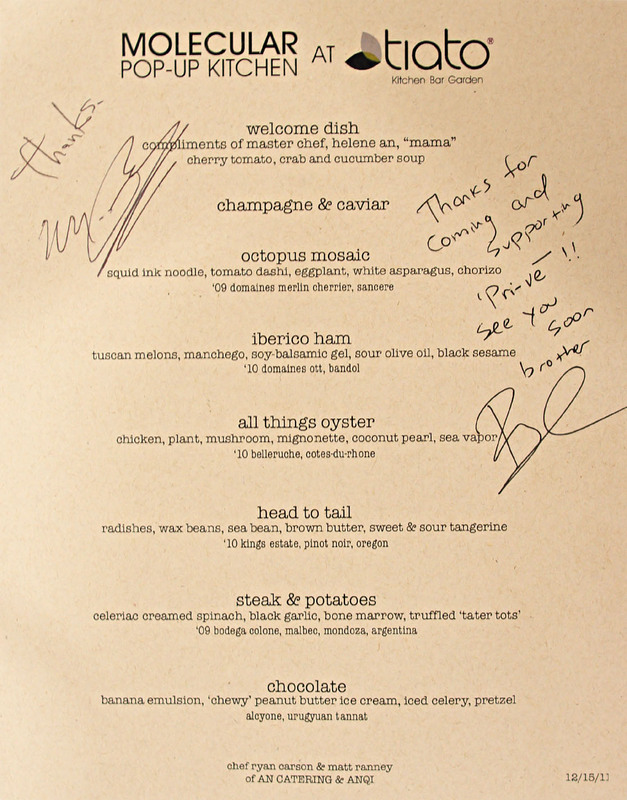 Given the freedom of running his own kitchen, the Chef began incorporating avant garde flourishes into his food, which eventually caught the eye of Elizabeth An, who subsequently brought Carson over to run things at AnQi, replacing former chefs Jacob Kear (ex-Lukshon) and Daniel Barron. Tonight, Carson dished up an eight-course tasting menu with wine pairing for a not-too-unreasonable $100. Click for a larger version. A quick bite to start the meal came courtesy of "Mama" Helene An. It was a refreshingly tasty morsel, with the inherent sweetness of the crab playing off the tomato nicely, while the cucumber provided an overarching lightness to the mix. Next up was a reworking of a dish that I'd had before at AnQi, but unfortunately, it didn't live up to the previous version. 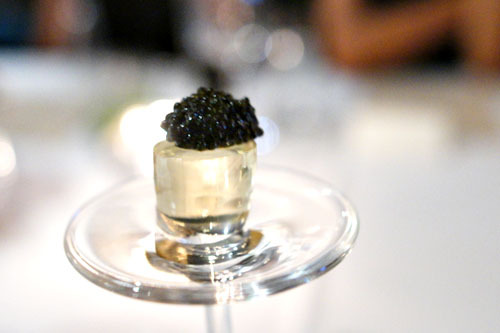 There was a nice interplay going on between the unabashedly salty tang of the caviar and the sugary, vinous Champagne gelée. However, the amuse was missing its chocolate "fizzy" tab, and as a result, lacked the effervescence that I was hoping for, as well as the soothing effect of the chocolate. 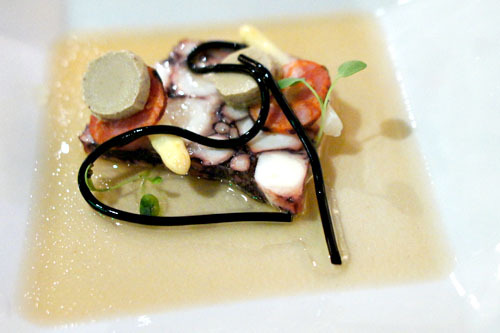 Octopus was rather lovely, with a supple, snappy consistency and a subtle flavor that was deftly augmented by the paired dashi jelly. I also appreciated the hint of spice and savoriness imparted by the chorizo, as well as the bright crunch of the asparagus spears. However, the coldness of the eggplant ice cream was too jarring for me, and the noodles were somewhat lost in the fray. There was a lot going on here, so perhaps the plate just needed a bit of editing. 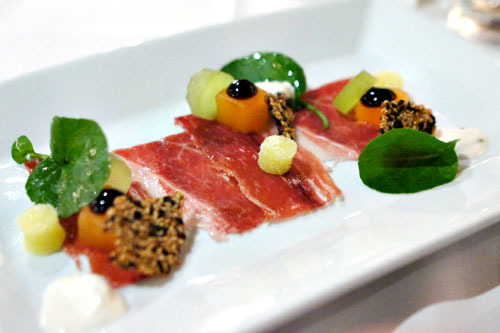 Jamón Ibérico formed the base to this classic, but reinvented pairing of ham and melon. The interaction between salty and sugary flavors was on point here, and I especially enjoyed the piquant counterpoints provided by the soy-balsamic and olive oil. My favorite element in this course, however, were the sesame chips, which imparted a fantastic, earthy, nutty essence to the dish that wrapped things up beautifully. The ocean-y aromas of "sea vapor" set the stage for this next course, which was a sort of a play on words. Chicken oysters are two small chunks of dark meat on the bird, and here they were put to great use--supple, immensely savory, delicious nuggets of goodness. 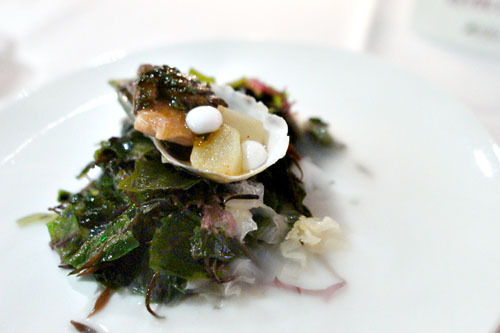 They were complemented by the roots of the oyster plant, as well as the subtle sweetness of the coconut globules. However, I really wish that the essence of actual oyster was more forcefully conveyed. Head to tail brought us a pig's head terrine and a pig's tail fried fritter. I began with the fromage de tête, and found it rather enjoyable, with a delightful mix of simultaneously sweet, tangy, and salty flavors. As good as the head was, the tail was even better, probably my favorite bite of the entire meal in fact, a gorgeous mix of lush and crispy textures with a profoundly porcine relish that, when paired with the sesame, gave it a fantastic Asian flair--yum! 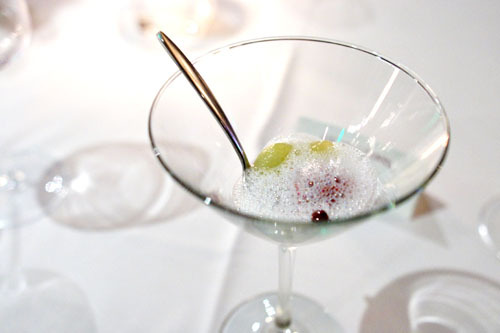 A palate cleanser countered the innate sugariness of beets with the tartness of lemon foam, while grapes served to moderate the course and add some textural variation. 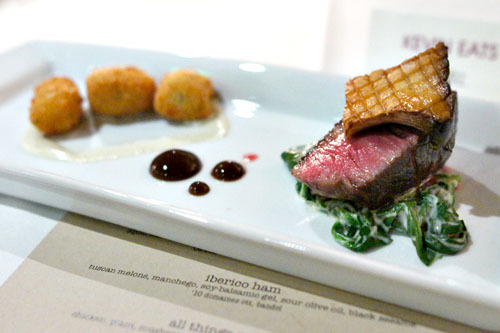 Our final savory course comprised the Chef's take on "steak and potatoes," and boy did it deliver. The steak itself was flawless, utterly spot on, cooked to a perfect temperature and brimming with plenty of bovine savor. However, it also went well with the tempering taste of the spinach, and I appreciated the mushroom as well. The "Tater Tots," meanwhile, were almost gnocchi-esque with their pillow-y consistency, and paired swimmingly with their sauce of bone marrow. Carson lacks a pastry chef at the moment, so he's currently doing all the desserts by himself. His presentation of the now-ubiquitous flexible chocolate ganache was very respectable, with the rich, dense chocolate playing well with the classic combination of peanut butter and banana. At the same time though, I really enjoyed the levity imparted by the celery, as well as the crunch and slight saltiness of the pretzel powder. Quite nice, actually. 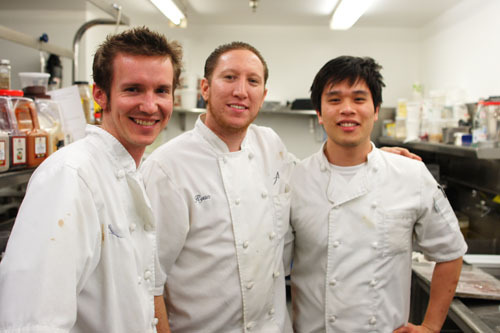 Chef Ryan Carson, along with Chef de Cuisine Matt Ranney (AnQi, Fleur de Lys, Daniel Boulud Brasserie, Crow Bar & Kitchen, Ambrosia) and Sous Chef Erick Lee. Although this meal didn't reach the lofty levels of his previous dinner at AnQi, Carson still managed to deliver an intriguing dining experience, but not without a couple of quibbles. I think his cooking is best when he doesn't try to do too much or overreach with the molecular modernist flourishes, but instead strikes an oft delicate balance between taste and technique. Nevertheless, I'm curious to see what the Chef comes up with at his own place. It'll be a small, ~30 seat affair, replete with an omakase counter (think Ink), so I'll definitely be on the lookout for that. It all looks amazing! Great place. Thanks for the exact description of the place.